Which is the latest version of OAK? I've got an earlier version of OAK. How is the latest version different? What’s new in OAK 4 is listed under About OAK. A version history that sets out the differences between revisions to OAK 4 is set out in the online help document. I've got an earlier version of OAK. What do I have to do to get the latest version? If you have version 4 of OAK, it will alert you to the appearance new version and ask for your authorization to download and install it. The automatic updating feature built in to OAK may be prevented from working by your firewall security software. In such circumstances you should download the latest OAK4.msi file and double click on it to install the upgrade. You may need help from your IT department to do this. If you have version 3 or earlier of OAK, you will need to purchase an upgrade, and download the new software onto your computer. Will OAK work on the Apple Mac? OAK 4 is a Windows-only application, and will not work on the Apple Mac, unless you run it in Windows using virtualization software such as VMWare Fusion or Parallels Desktop, with the Windows version of Excel. We do not officially support this. Does OAK work in 32-bit and 64-bit Excel? Yes. The single OAK4 msi file installs OAK and registers it for use in both 32-bit and 64-bit Excel. My computer won't let me download OAK. What can I do? Some companies set up firewalls to prevent employees from downloading executable files. Companies that do that will probably also prevent executable files from being sent by email, and prevent executable files that do arrive from being installed on workstations except by designated staff. Your best option is therefore to get help from your IT department. Will OAK install in Windows 8 or Windows 10? I downloaded OAK to my Apple Mac to use in Parallels Desktop, but the installer says the version of the file is not compatible with the version of Windows I'm running. While we don’t officially support the running of OAK in Windows in the Parallels Desktop environment, we suggest you try downloading the installer using Internet Explorer rather than Safari. I have a computer at work and a computer at home. Can I use OAK on both of them? If you contact Operis explaining that at any moment you could be using one computer or the other, but never both, we will enable a second activation of your serial number for the second machine. I have switched to using a new computer. What do I have to do to get OAK to work on the new machine? If you are using OAK 4.3 or later on the old and new computer, transfer a serial number from the old computer. Then activate your serial number on the new computer. An employee in my company no longer needs OAK. How can I transfer it to another machine? If you are using OAK 4.3 or later on the old and new computers, you would perform a serial number transfer on the old computer. Download OAK and install it on the new computer. Then activate your serial number on the new computer. If you cannot perform the serial number transfer on the old computer, send your serial number to Operis, explaining that you wish to transfer OAK to the new computer. We can deactivate your serial number for re-use on the new computer. If you have been using OAK 4.0 to 4.2, and you have OAK 4.3 or later on the new computer, perform a serial number exchange, then proceed as for OAK 4.3 or later. If you are moving from OAK 4.0 to 4.2 on the old and new computer, please email your new product ID to Operis explaining that you wish to transfer OAK to a new computer, and also read about serial number transfers so that you can see how upgrading to OAK 4.3 or later helps you do these transfers without the delays associated with support requests. How can I turn OAK off? You can instruct Excel whether or not to load OAK through the Add-in manager. A complication is that Excel 2003, and earlier releases, have two of these Add-in managers, one that is easy to find, and one that is not. While the first one controlled earlier versions of OAK, you need the second one to control OAK 4. This is further explained in the on-line help manual. OAK has disappeared from the ribbon or menu and the COM Add-ins manager doesn't list it. How can I get it back? Excel has probably placed OAK in the Disabled Items list. To make it available again, the process is different in Excel 2007-2016. 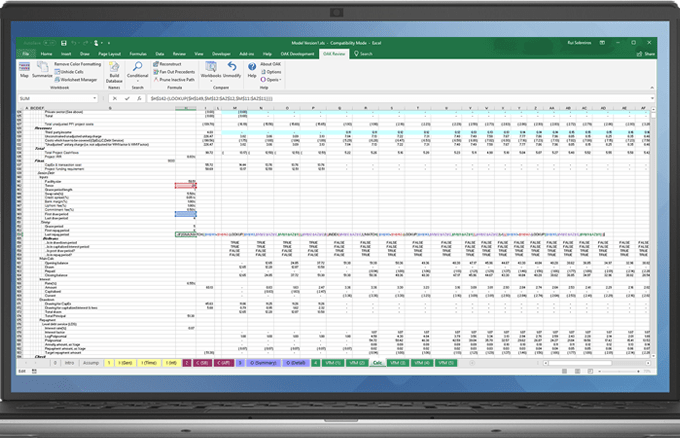 For Excel 2007, click the Office Button, then Excel Options. For Excel 2010-2016, click the File button then the Options button. Then for Excel 2007 to 2016, go to the Add-ins tab. Locate the “Manage” drop down box and set its value to “Disabled Items”. Click the “Go” button. Highlight OAK in the list, then click “Enable”. Close the Disabled Items window. You may need to re-enable OAK in the COM Add-ins manager. Activate one of OAK’s dialogs, e.g. compare workbooks, but don’t click the Compare button on the options window, just leave it there waiting for input. Then use Task Manager to end the Excel process. Then, start Excel again. You may be prompted to disable the Operis Analysis Kit – click yes. In any case, you’re likely to find that OAK has been sent to the disabled items list, whereby you can perform the above procedure to release it. OAK has disappeared from the ribbon, menu and disabled items, and only re-installation restores it temporarily. What can I do? While it hasn’t been confirmed, we have observed cases where it seems that OAK’s COM registrations get deleted by unknown processes on the computers of users in some IT environments. In this case, you need to ensure the IT staff make sure that their systems are configured to permit the COM registrations that OAK’s installer requires. Latest release updates and articles on how to make better use of the software.